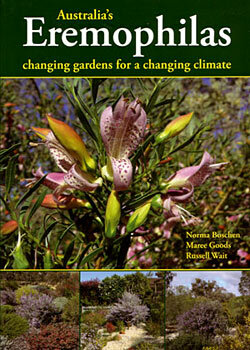 Three amateur enthusiasts, each members of the ASGAP Eremophila Study Group, have produced this book, having seen the need for growers of this diverse genus of Australian native plants to have available a resource which can be used both for photo-identification and a basis upon which to build their knowledge about cultivation and propagation. They saw the opportunity to further promote the genus approximately two years ago when the Wimmera Growers Group was invited to host the FJC Rogers Seminar, "Eremophilas 2008", in Horsham in October 2008. Norma Boschen, Maree Goods and Russell Wait, using their own experiences and photographs, supplemented by assistance from a number of other enthusiasts, have produced a magnificent book. It will prove to be a valuable educational tool as well as being an attractive book, filled with photographs to be appreciated by expert and amateur alike. Collating their immense knowledge of the genus through many years of personal involvement, both in the field and in their extensive gardens, they have pieced to together a valuable resource for all to appreciate and learn from. Not only will this book be of value to hobbyists, but it will provide valuable information for landscapers and garden designers, as well as being a resource which professionals can use - a very worthwhile supplement to the publication Eremophila and Allied Genera Chinnock R J (2007) (see review here). In the Foreword, Dr Bob Chinnock, refers to the changing practices which need to be exercised by those who grow plants in their gardens and parks. He congratulates the authors for their forethought in producing the book and commends it to readers as a valuable source of information: a complete guide to the cultivation of Eremophila. A brief history of the genus is presented. The Question: "Why Grow Eremophilas?" is posed; followed by the fundamental requirements of cultivation, propagation, and a brief review of pests and diseases as they relate to eremophilas. The body of the presentation is conveniently divided into four sections - Small Trees and Large Shrubs, Medium Shrubs, Small Shrubs and Prostrate Shrubs - based on the 'habit' of the plant. Within each section, species are accurately described and superbly illustrated. In most cases a full page treatment is given for each entry. A brief etymology treatment is given at the beginning of each entry, followed by a compact, but comprehensive description with comments on the distribution of the species. Each species is discussed in detail with regard to its cultivation and growing hints are supplied. A summary is provided, giving the reader an overall perspective of the plant. In addition each taxon is illustrated by photographs, many taken in the field, illustrating the in situ habitat of the plant, together with the detailed macro-view of individual flowers, taken either in the field or from cultivated plants. Colour forms are often illustrated. Overall the photographic record is excellent and will be a valuable tool for readers to be able to identify plants in their collections or seen in the field, without recourse to extensive keys or text references. Hybrid plants are to be found both naturally and in cultivation. Those which are now recognised as useful garden plants have been recorded, with a note that more will be used in the garden when they have been proven as horticultural subjects. Eremophilas of the future are recorded in the final chapter; species listed include several which are not currently in collections but could be in the future. This publication is highly recommended, and from the number of books sold at the Seminar, it is already well established as a resource for those currently interested in this unique genus and will no doubt prove to encourage others to use these popular plants in their gardens. From the newsletter of ASGAP's Eremophila Study Group, November 2008. Colin Jennings is the leader of that Study Group.